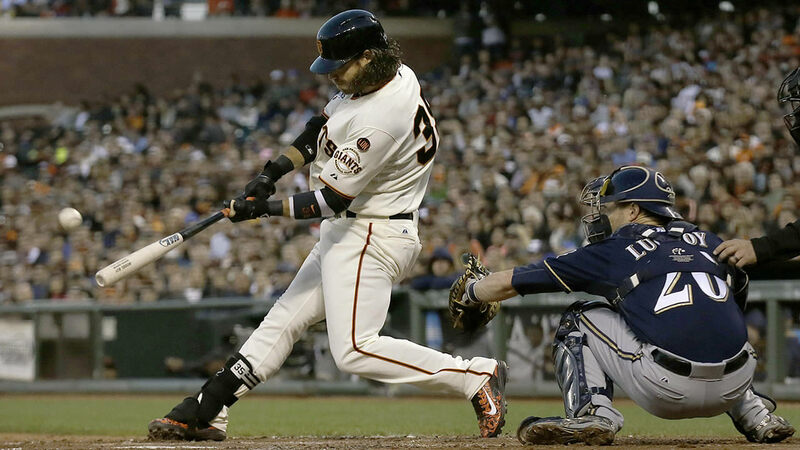 SAN FRANCISCO -- Brandon Crawford is hearing about his home run distances approaching Barry Bonds territory. Crawford hit a two-run homer an estimated 424 feet to help rookie Chris Heston win his fifth consecutive decision, and the San Francisco Giants beat the Milwaukee Brewers 4-2 Monday night for their sixth straight victory. "He hit where the big boys hit 'em," manager Bruce Bochy said of the fourth-inning drive to right-center on a 3-0 pitch. "You've got to get all of it to get it go there." Heston (11-5) allowed two runs and five hits over seven innings as the defending World Series champions moved a season-high 11 games over .500 with their seventh home victory in a row and 12th in 13 overall. Milwaukee outfielder Carlos Gomez was ejected in the ninth after tossing his helmet following a replay reversal of what had been a stolen base. He later threw a batting glove. Brewers manager Craig Counsell came out to argue and also got tossed, his first career ejection as a player or manager. "I never looked at the umpires," Gomez said. "I never argue pitches or any calls. I was just frustrated, and they throw you out." Pinch-hitter Gregor Blanco had an RBI double in the seventh and Brandon Belt added a sacrifice fly to back Heston, who won his third straight start. He induced inning-ending double plays in the first, third and fifth to take a share of the major league lead (22) with Minnesota's Kyle Gibson and Mike Pelfrey. Crawford, the shortstop, said Heston's quick tempo "keeps us on our toes." "We had guys on base and they were able to get the double plays," Counsell said. "We couldn't get that next hit." San Francisco is 9-1 since the All-Star break and pulled within a half-game of the first-place Los Angeles Dodgers in the NL West. It's the closest the Giants have been since June 29. Crawford hit his team-leading 15th home run. "I'm sure Buster will catch me sometime soon," he joked of teammate Buster Posey, who has 14. Milwaukee slugger Ryan Braun was a late scratch because of lower back tightness, forcing Counsell to shuffle his lineup shortly before game time. Brewers starter Kyle Lohse (5-12) hung in there through 6 2-3 innings. He allowed four runs and five hits, walked three and didn't have a strikeout while losing his second straight start and dropping to 0-3 over his past four. Matt Duffy had three more hits for the Giants, a day after hitting a two-run homer and driving in three runs. Sergio Romo pitched the ninth for his second save as manager Bruce Bochy stayed away from closer Santiago Casilla as planned after a long Sunday outing for his career-high 26th save. Giants left fielder Nori Aoki returned from a broken right leg to face his former team, batting eighth as Bochy stuck with a lineup that has been working so well with Angel Pagan leading off. Aoki received a warm ovation during pregame introductions after mingling with former teammates, who offered him plenty of hugs and handshakes. He went 0 for 3. At last, the Giants have nearly the healthy roster they expected leaving spring training. "We've been playing good baseball," Crawford said. "This is kind of what we were looking for." Jonathan Lucroy hit an RBI double for the Brewers, who dropped their third straight and fifth in six games. San Francisco is 12-1 in a stretch of 21 straight games against losing teams.